This pie is rich, really rich, and so creamy and decadent, that it is not for the faint of heart. It's not for those who don't like intense chocolate. It's not a pie to serve after a heavy or rich meal. But, it is for those among us who crave a bit of rich, creamy chocolate at times. It's luscious with a cup of coffee or a glass of iced tea. 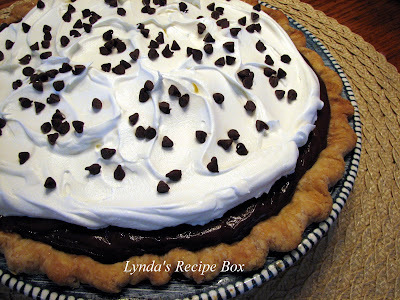 I made this chocolate pie last week for a church pot luck and it was gone in a flash. So quickly was it gone that we had nary a sliver. So I made it again this week so we could try it. If you're needing a serious chocolate fix, give this pie a try! 1 tablespoon unsalted butter, softened - recipe calls for 2 T.
1 tablespoon vanilla- yep, you read that right! 1. Bake the pie shell; either your own recipe or the refrigerated pie crust from your grocer. Cool. In a large, heavy bottomed sauce pan, mix 2 3/4 cups of the milk with the sugar. 2. In a small bowl, combine the 1/4 cup of milk with the cornstarch. Whisk in the egg yolks until thoroughly combined. 3. Heat the sugar and milk mixture over medium heat, stirring constantly, until the milk is scalded, but not boiling. To temper the egg yolk mixture, take about 1/4 cup of hot milk and quickly whisk into the yolks. Then add some more hot milk, a little at a time, whisking quickly with each addition., until the yolks are very warm. Now, slowly pour the yolks mixture into the milk, and again keep whisking so that the egg doesn't get clumpy. Bring the pudding to a boil, stirring constantly. Let cook about 2 minutes. 4. Remove pudding from heat and stir in the butter, the vanilla and 1 3/4 cup chocolate chips until incorporated. Pour the pudding into the cooled pie shell. Place plastic wrap over the pudding to seal. This will ensure that the pudding does not form a skin. Cool. Refrigerate for several hours, or until cold and firm. Remove the plastic wrap and top with whipped cream and remaining 1/4 cup chocolate chips. I used some mini chocolate chips for topping instead. Enjoy! Keep refrigerated. Supposed to serve 8, but it's so rich that I cut into 10 servings. NOTE: By tempering the yolks this way, the pudding was smooth and creamy with no lumps. Oh my, this chocolate, although decadent, seems like the perfect dessert for my dark chocolate loving soul! I love anything chocolate! This recipe looks delicious. I like the fact that it has a lot of vanilla in it. I am going to make this pie! That is a perfect name for the recipe! Chocolate is the way to go and this looks delicious! There's nothing more decadent that a rich, luscious chocolate pie. This is a perfect dessert when we have just a salad for dinner. That is simply beautiful and I cannot imagine how good it is! YUM!!!!! Love all your great recipes. That is one delectable looking pie. It is a must try for me. That's seriously rich and heavenly chocolate treat! Oh wow, this does look super rich! There is no chocolate too intense for me! As I read all - the only I think I could think of was "perfect." Truly a delicious, inviting cake. lovely pie, lynda! happy 4th! What a fabulous looking pie, Lynda! So dark and decadent. If I'm looking for a chocolate fix, I sure don't have to go farther than this! While I'm not a chocolate lover I will keep this in mind for special occasions when I have a few over the house. 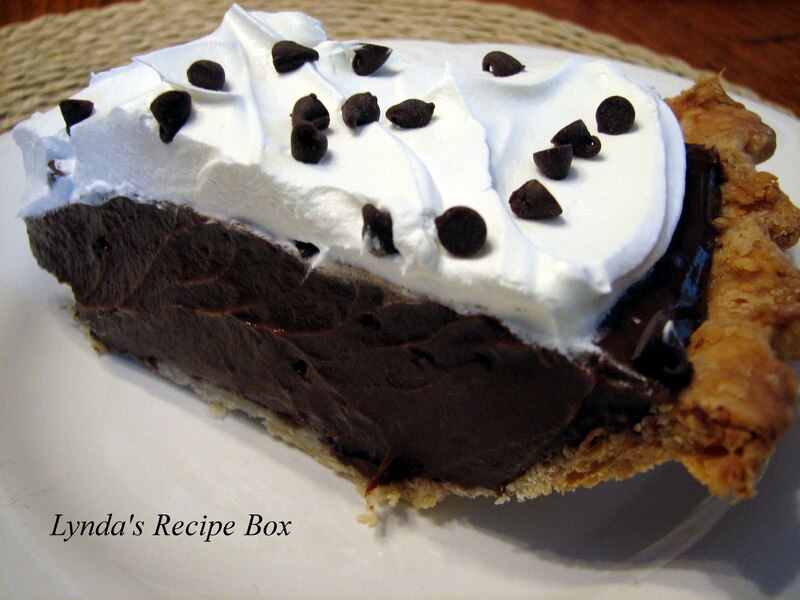 This pie is a chocolate lovers dream. You are absolutely right this is not for the faint of heart. Love it. Wow! Wow! That chocolate pie looks so good, very tempting pictures. Oh Lynda - it really does look heavenly! This really looks like heaven to me!!! Delicious. Lynda, if I were a true chocolate lover I would be sorely tempted. Your description of this pie would entice me to a nice sliver. I'm sure it is big YUMS up for chocolate lovers! My heart fluttered upon sight of this pie. This certainly does not sound suitable for the faint of heart. Good job, Lynda. This is the best pie ever!